Scare TV Guia magazine from the mid 1960's. 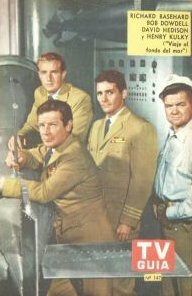 Cover features the Voyage cast, Richard Basehart, David Hedison, Robert Dowdell, and Henry Kulky. Magazine measures 5x5 x 8 inches, and was issued in Argentina.